Used Apple and Macintosh computers, Apple Monitors and Macintosh compatible. Quality pre-owned Apple and Macintosh equipment. Used Apple and Macintosh computers and peripherals. Apple Monitors, Macintosh Computers. Apple peripherals. After market Apple and Macintosh compatible equipment. Scroll down the page or use the table below to go to a section of our page. Used Macintosh IIci computer. 8 megabytes of RAM, 100 megabyte hard drive. $75. Plus shipping. NONE AVAILABLE at this time. Order a computer and get 10% discount when you order a monitor also -- 10% on your entire order!! Our computers and monitors come and go EMAIL for to see what we have currently. SPECIAL!! Used Macintosh Extended Keyboard II model M3501 with cable. $29 20 available. Plus shipping based on your zip code. All we have left have some yellowing on the keyboard caused by exposure to UV light. Amphenol Model ENT 2 Twisted Pair Ethernet Transceiver. 10BaseT. AAUI to RJ45 connectors. 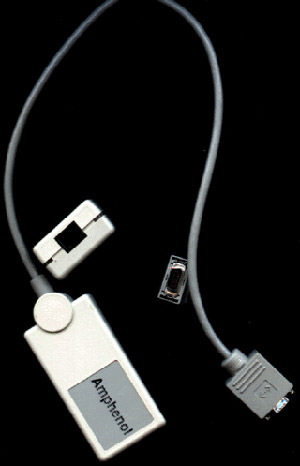 See picture Picture shows one unit and the connector ends. $10 each or 2 for $18 plus $5 shipping. 1 megabyte 30 pin simms. $6 each. SCSI cable HDI-30 to Centronics 50. Fits rectangular connector on back of PB 170, 180 and ????? Not sure what it looks like? Here it is. What both ends look like. $39 Plus $5 shipping. Used NuBus Macintosh display card model 820-0600. Display 16 million colors on your Apple 13 and 14 inch displays. 256 colors on an Apple 21 inch display. Yes, this card will drive your Apple multi scan 15 monitor in millions of colors. $39 + $5 shipping. This card is 11 3/4 inches long and fits Mac IIsi, ci, cx. Card guarantee. It will drive your monitor or we'll refund you money. I don't know all the monitors it will drive, but I guarantee it will work or your money back. Full $63 refund --- all you pay is the return shipping. However, it does drive the monitors we say it does. We ship within 3 working days of receiving a certified check or money order or within 12 working days of receiving a personal or business check. Sorry, we don't accept credit cards yet, but you can pay with your credit card --see below. California Residents, add tax. If you are outside the USA contact us for special arrangements. Shipping is more, and payment needs to be arranged. Offers that include shipping within the USA, do not include Alaska and Hawaii. Special arrangements must be made for these two states. A properly packaged monitor to Alaska, weight 36 pounds, box size 24x24x24 inches is $115. Improperly packed in a 20x20x20 box it's still $78 via U.P.S. 30 day warranty on all used equipment unless otherwise stated. Guaranteed quality and service. All listed equipment is based on available stock. *Apple and Macintosh are registered trademarks of Apple Computer, Inc.
We've been in business since 1987. This used Macintosh computer site was put on the internet on December 31, 1997. Excellent online SECURE payment service. FREE and SAFE, with NO FEES!! Make Visa or Mastercard payments with PayPal - it's fast, free and secure! Just click on the PayPal Logo above and sign up today. Use your Visa or Mastercard or personal check and PayPal to pay any vendor* on the internet. *As long as they are a PayPal member or are willing to sign up with them.